There I said it, phew. 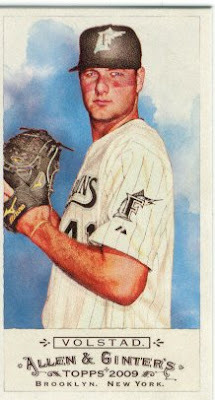 I swore up and down, left and right that I would not buy a single pack of 2009 Allen & Ginter as a result of the previous years sucking royally (in my opinion). Part of what I never liked about these cards was the design was so bland and color-less, in addition to getting cards of Ferris Wheels. 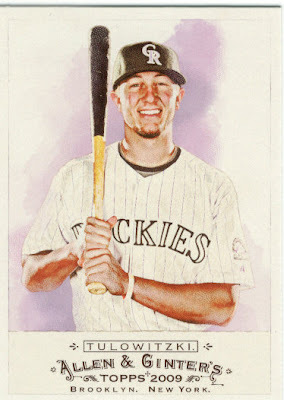 Then the other day in Target I saw a random rack pack of 09 A&G, it was slightly opened for some reason and it was the only one. I figured if I were going to give in, going for a $5 trial pack wasn't terrible. I opened the pack while walking to the car, something else I never do. I was rather surprised at the cards design once I had them in my hands. I won't lie, I haven't really paid much attention to the scans on other blogs when reading them just from my own prior disgust with the design. So my apologies for cracking jokes and busting chops for the addiction, it isn't as terrible as years past. I won't throw anymore stones, promise. Will I end up buying more of these? Perhaps, but with the card show coming up in a week or so I will probably just get what is left out of this set that I need that weekend. Hanging my head in shame and disappointment shaking my head. 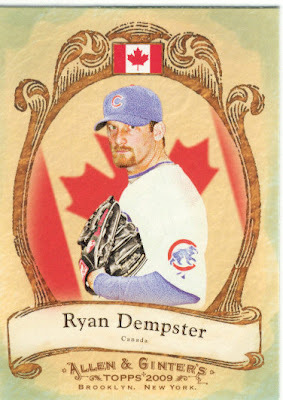 I actually like that Dempster card. :) You held out for a long long time.